In a recent in-disciplinary action taken by General Court Marshal, an Indian Air Force flight lieutenant has been dismissed from service and send for 2 years of jail by the General Court Marshall on the charges for not following the senior’s orders along with charges of assaulting the seniors. The sources explained about 20 chargers by the seniors over the pilot, which includes not eating food, assaulting seniors during custody in missile base and stealing TV remote controls from the senior officer in officer’s mess. On the contrary, the pilot has appealed in the military court in New Delhi challenging his sentence. The officer alleged harassment from the senior’s side and also the case of not providing proper medical treatment for injured knee that he bear during a sports accident, which took him out of the flying duties. The officer has requested in his plea to the tribunal to suspend his sentence as he has already completed more than the 9-month sentence in custody during trails. As per the sources, the officer was sentenced 9 years of the rigorous sentence but was later reduced to 2 years. The pilot used to fly Antonov-32 Cargo plane while serving as flying officer. After getting a knee injury during a sports event, he was taken out of the flying service and was given a 2-year note to rejoin his service after complete treatment of his injury. After grounded from his flying duties, he was deployed in Bhuj, Gujarat in 2013, where he alleged to be harassed by the superiors. He has also won a gold medal in national shooting championship. 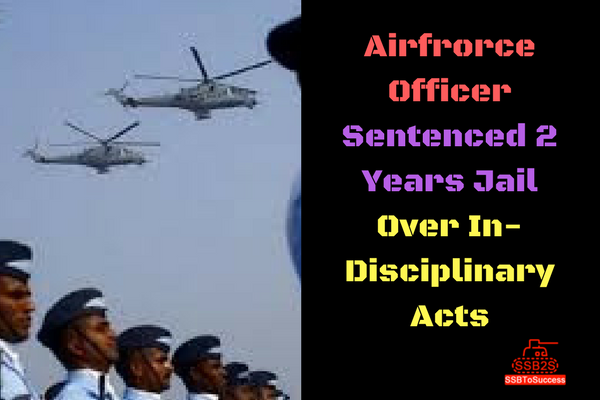 The pilot claimed that his superiors denied the proper treatment of his injury that made him permanently retired from the flying duties which called for 2 years of the re-joining of the flying service after complete treatment of the injury. The officer was permanently retired from flying duties on 21 April 2016. The general court martial freed him on bail for a bond of 25,000 and suspended the sentence of the pilot and the court has put the condition for the pilot to surrender his passport and avoiding visiting any air force base or residential area of Delhi where his wife, a military officer is posted in Delhi. Further jurisdiction and proceeding in the case will decide the fate of the young officer. And firm steps would be taken keeping the judgment transparent and unbiased.